Perhaps you knew the moment you started planning your wedding. Or maybe it’s a passion that’s developed in you since you were a child. Whatever the reason, you have made the choice to take your love for all things weddings and create a place of information and inspiration. Your wedding blog or website is the new lookbook for today’s millennial bride. Now that you have developed a creative voice in the wedding space, it is time to take your passion to the next level. We know that some of you even juggle the roles of editor-in-chief, graphic designer, social media marketer, web designer and mom all in one. However big or small your business is, you are an entrepreneur and you deserve to be compensated for your ideas. BrideClick can partner with you to help monetize your wedding site and give you the opportunity to work with top bridal brands in the industry. Your site is a direct portal for advertisers to reach their target market—brides to be, wedding planners and other industry professionals. BrideClick can help you identify the ways in which you can showcase great brands to your readers and get paid for it. We offer many opportunities, some that maybe you didn’t even know about! So we have created a series designed to help you understand what advertisers are looking for with advice on which options are right for you. Image ads are the most recognizable ads on the web. You can find them all over a webpage, but the most popular are above the fold. Above the fold placements signify the portion of your website that is visible once the page has loaded. This is the very top of the page and is the most favorable section by advertisers, assuming that their ads will be viewed and clicked more often. To get started with Above the Fold Banners, set aside space at the top of your website where you would like to host ads. The Interactive Advertising Bureau (IAB) has created guidelines on the standard ad units with the most common sizes being 300×250 and 728×90. Then, let BrideClick do the rest! Follow banners are typically 300×600 in size and appear as the last placement of your sidebar. These ads will then “follow” the user as they continue to read through your content. To qualify for this ad unit, you need to ensure that your site has enough blank space at the bottom of your sidebar to create the runway for the banner to scroll. 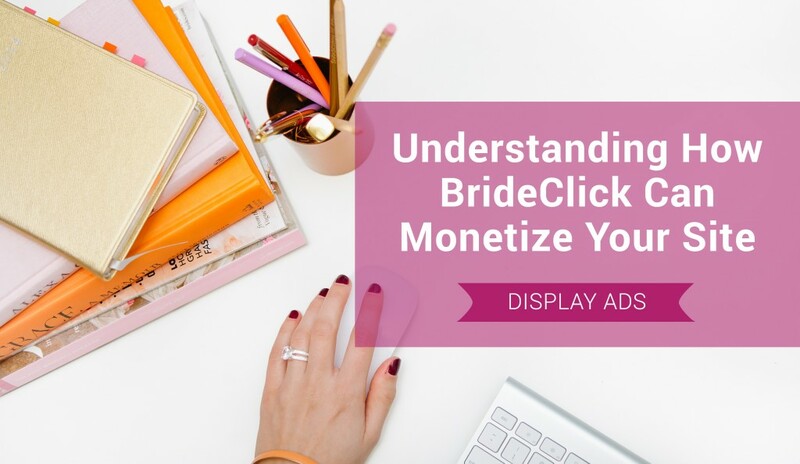 Now that you have set up the space on your site for display ads, BrideClick will be able to bring you advertising dollars from some of the best brands in the bridal business. There are many ways in which advertisers try to reach their target audience, but display ads are a great way to help build brand awareness. Still, there are tons of measuring tools available for advertisers to analyze their return on investment. So while it’s your job to create engaging content that keeps your readers coming back to your site, it’s our job to identify the brands that your audience loves the most. Our goal is to find the right match between your brand and the advertisers’ brands and to build a connection with your audience.